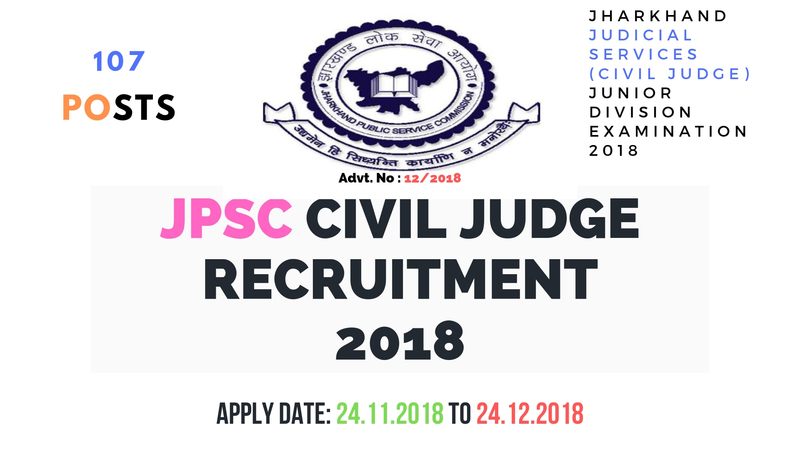 Jharkhand JPSC is inviting online applications from the eligible candidates for the vacancies of civil judge PCS j post. Those candidates who have met the educational requirements can go through the following requirement advertisement. By reading the full notification they can also be able to apply online. Application begins from 24th November 2018. Last for applying online is 24th December 2018 up to 11:45 PM. Last for paying online fee is 26th December 2018. General/OBC and candidates from other state need to pay ₹600 as application fee. Application fee for SC/ST candidates is ₹150. Application fee can be paid through any kind of online payment mode like debit card, credit card or net banking. E Challan mode is also accepted. Candidates must have completed Bachelor degree in law (LLB) through a 3 years or 5 years of regular course. Age limit for the job is minimum 22 and maximum 35 as on 31st January 2018. For junior division Civil judge 107 vacancies are available there. The duration of prelims will be 2 hours where main exam will be of 4 papers of 100 marks each. Three hours is the duration of main exams. Last date of filling online form is 24th December. One have to provide full personal details along with the copies of address proof, age proof and educational qualification proof. Application form must be filled up with care. They also have a helpline number 0651/221309 for “”how to apply” help.